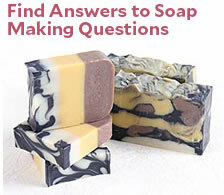 Are you new to Cold Process Soap Making? 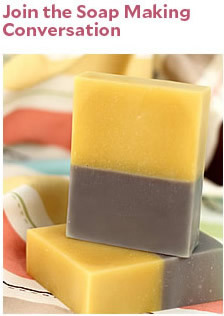 These simple CP recipes are perfect for beginning cold process soap makers. We will keep adding recipes to this page, so please check back soon! Remember, the lye water mixture is always added to the oil and not vice versa. If you have never made cold process soap before, we strongly suggest getting a couple of basics under your belt before diving in. Check out Soap Queen TV on Cold Process if you want to get started with cold process. Also, a good book to start with is Susan Miller Cavitch’s The Soapmakers Companion. When handling lye, please use gloves and goggles and do not breathe in the fumes. 1. Suit up in safety goggles, gloves and long sleeves. 2. Add the lye to the water. Stir well taking precautions to not breathe in the fumes. Set the mixture to the side and allow it to cool to approximately 110F. You can put the lye water mixture outside if you are not in a well ventilated area. 3. Add all your oils together and melt. Allow them to cool to approximately 110F, or within 5 degrees of the lye water. 4. Add the lye water mixture to the melted oils, carefully. Stir vigorously until trace occurs. Trace looks like a thin pudding. A stick blender will help speed trace along. If you are stirring by hand, these recipes may take up to an hour to trace. 5. Pour your traced soap mixture into your molds. Pop out after 3 to 5 days and allow to sit for a full 4 to 6 weeks to cure and finish the saponification process. Ounces of Distilled Water recommended 23.760 oz. Ounces of Distilled Water recommended 23.100 oz.